Bringing the simple and effective fixed-line fishing methods of Japan to the Ozarks. Tenkara, keiryu, seiryu, and more! Japanese fixed-line fishing methods for trout and warmwater species in the Ozarks, the KC Metro area and beyond. Tenkara is the modern version of traditional Japanese fixed-line fly fishing for salmonids in high gradient mountain streams. Ideal for those who've never fly-fished before, or for those fly anglers looking for a new challenge. Japanese fixed-line bait fishing for trout. Quite possibly the most effective way to catch stream trout ever developed! In addition, the tightline technique of keiryu fishing makes deep-hooking very rare, enabling catch and release fishing with bait! Literally, "clear stream," or lower-gradient streams. The Ozarks abound with fish that are ideal targets for seiryu fishing with both bait and flies: sunfish, rock bass, creek chubs, etc. The rods are typically much softer than tenkara or keiryu rods, so even a small fish will give a satisfying battle! Yes, you can catch carp on a fixed-line rod, and you should! Carp are perhaps the most overlooked game fish in North America, but have become increasingly popular with both bait and fly. With a Japanese fixed-line carp rod, you can use either to pursue a true big-game fishing experience! When many people discuss tenkara, what they mean is fishing for trout in streams in the manner of the Japanese. So for all those other ways you can use a tenkara (or keiryu or sieryu or carp) rod and a fly, I have coined the term "Un-kara." It may not be something that the Japanese do, but it is very fun and effective. 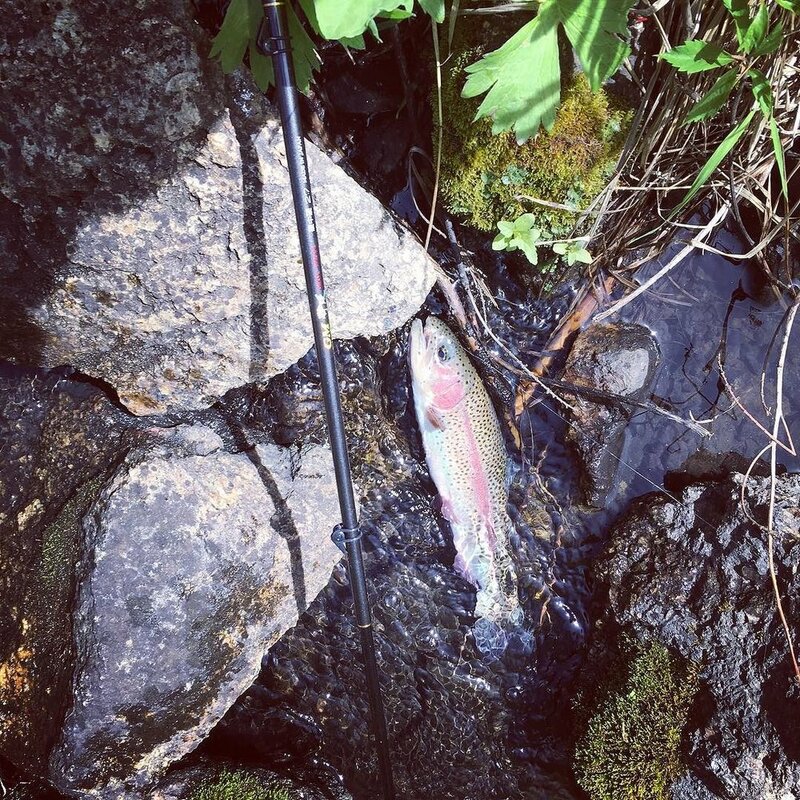 Most anglers have easy access to bass and panfish, so it's only natural that people would use a tenkara rod to catch them, and catch them they do! I believe that stream smallmouth bass are an ideal quarry for tenkara, and the Ozarks have far more smallmouth water than trout water. In Japan, there is an entire world of angling dedicated to catching tanago, the world's smallest game fish. In this sport, the smaller the catch, the better. While we have no tanago (bitterlings) in the US, we have lots of small fish that make excellent targets for the tackle developed for tanago. The Ozarks are especially rich in small fish species such as minnows, darters, sculpins, and madtoms and thus a micro-fisher's paradise! Yes, I still use a rod and reel to fly fish. 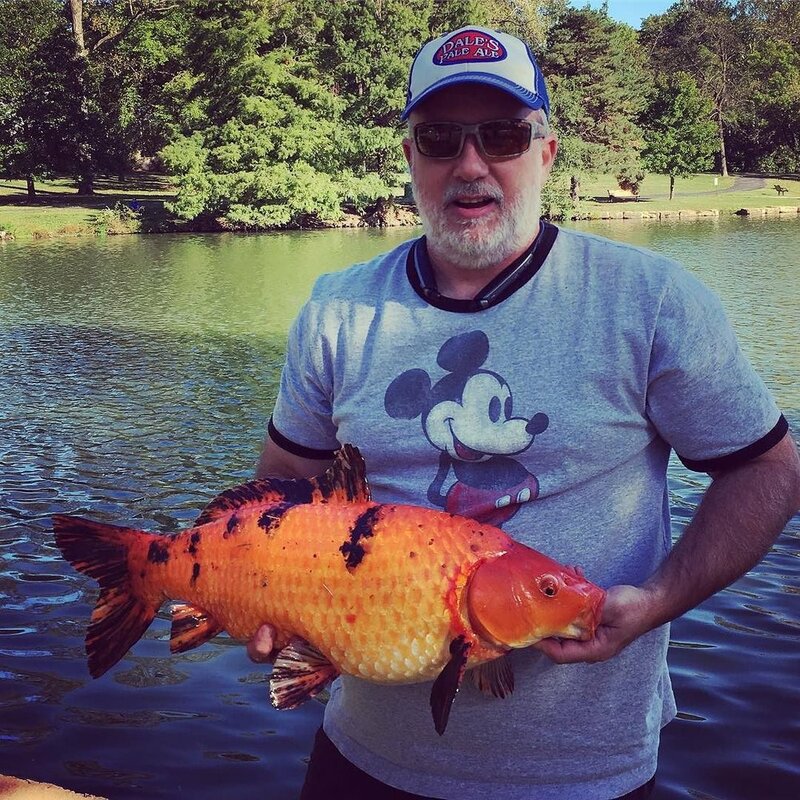 I recently caught the goldfish/carp hybrid pictured above on an 8-weight saltwater rod! Ironically, tenkara has rekindled my interest in fly fishing. Recently I have been bitten by the trout spey bug. I look it as complementary to tenkara. When precision presentation is called for, I’ll use tenkara. When I want to cast long distances and cover a lot of water by swinging wet flies and streamers, I’ll use a two-handed switch rod. It’s all good.